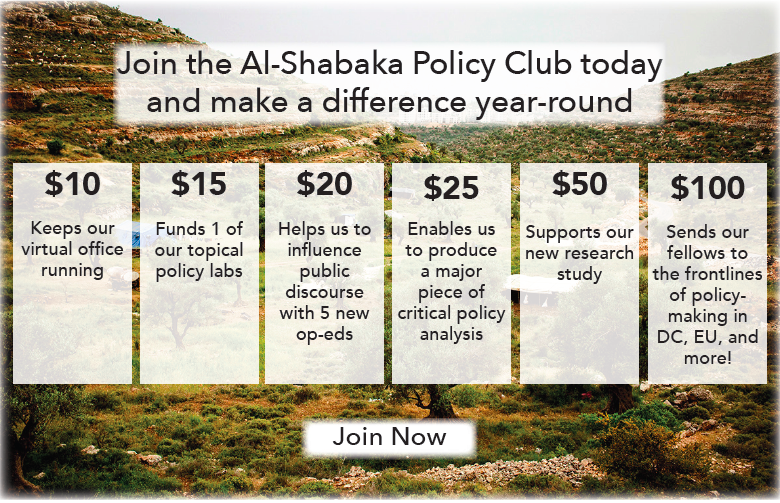 Help us raise $18,000 to amplify Palestinian policy voices in 2019. Palestinian human rights are under attack. Global powers are working to suppress Palestinian voices and rights. The Trump administration’s move of the US embassy is helping Israel to legalize its annexation of East Jerusalem, while defunding UNRWA and working to re-define who is - and isn’t - a refugee. Meanwhile, Israel continues its violent attacks on peaceful Palestinian protesters under siege in Gaza, and criticism of Israel around the world is being silenced by conflating it with anti-Semitism. 1st by bringing together Palestinian analysts form all over the world, turning our weakness of fragmentation into a strength. 2nd by working with the many members of Al-Shabaka who head sister organizations run by and for Palestinians. 3rd by working with strategic allies in the global movement for Palestinian rights, like the US Campaign for Palestinian rights, the Palestine Solidarity Campaign, and Jewish Voice for Peace. Next year, we’re committed to doing even more. In 2019, we’ll ramp up our analysis and outreach to ensure that our analysis gets in the hands of change-makers and helps shift the discourse. Increase our reach with joint advocacy campaigns alongside our partners and allies, situating Palestine within the broader intersectional struggle for global human rights. Israel and its allies are working toward the erasure of Palestinian voices and rights. In 2019, with your support we will do even more to combat their schemes and bring Palestinian strategies for rights to the forefront of policy discussions.